Mobile marketing intelligence company Warc has released new research which found that mobile ad spend reached $48bn globally in 2015, making up 30% of all internet ad spend. The research found unsurprisingly, that mobile ad spend has been doubling over the last two years, and by 2017 it is expected to account for 44% of all online ad spend reaching a massive $90bn. Warp found that desktop spending has stagnated at around $112bn and they predict that this is likely to fall over the next few years. They state that the US, China and the UK are the GEOs that are leading this drop. As a core driver for online growth the shift is most definitely to mobile, with mobile already making up a third of all online time globally. Mobile video is one of the most rapidly growing ad formats, having doubled from 2014 to reach $1.4bn alone in China last year. 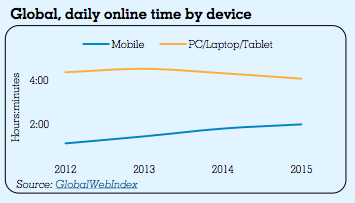 Warc states that by the end of 2015, half of China’s online video ad spend will be mobile. 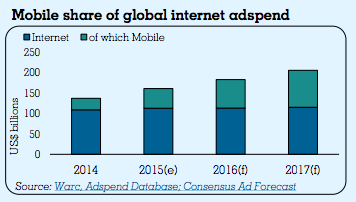 On a worldwide scale, ad spend on mobile video will grow to $10bn in 2016. 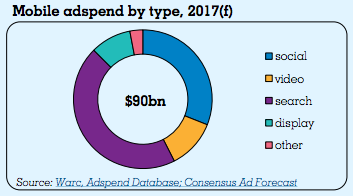 However, the biggest chunk of mobile ad spend is search advertising and is expected to reach $40bn by 2017, which is double that of today’s current spend.